Those of us who learnt to dance, were able to endure the past year, and get ready to face all challenges that 2009 may present. 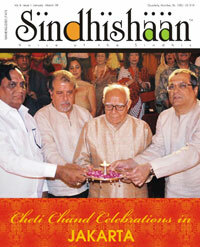 Sindhishaan turns 8 in 2009; on April 3rd, to be precise. As fortuitously, 'Ram Navmi' also happens to fall on that very day, a blessed and prosperous year for Sindhishaan could be augured. One can't help getting nostalgic and reminiscing the pangs of anxiety, experienced during those critical times of start-up, and the thrill of achievement at the time of release, of the first issue of Sindhishaan. I am often complimented for this supposedly thankless service to the Sindhi Community, but, honestly speaking, my personal gain has been verily humungous. The insight and in depth knowledge about our history, roots, culture and heritage; the intimate relationships cultivated with my Sindhi brethren, all over the globe; the ability to read Sindhi in the Arabic script; the overwhelming love and affection showered on me by the stalwarts of not only my community; all this and much more, would have not been possible, but for this labour of love. Here I must share a little secret with you, especially for the readers who write to me in Sindhi, in the Arabic script; I am still not comfortable reading hand-written Arabic script; but I have no problem at all with printed text in Arabic. Initiating the publication of SINDHISHAAN has thus been one of the most beautiful and important occurrence in my life. I have got to know myself, identify with the most glorious and truly spiritually secular community of the world. And in celebration of this joy and glory of being a Sindhi, I present 'CHETI CHAND in JAKARTA' as the cover feature of this issue. With elections round the corner, in India, our very own living legend Ram Jethmalani has proposed a manifesto for adoption by aspiring parties, which is also included in this issue. Maybe we can persuade him to draft a WISH-LIST-CHARTER, for Sindhis in India, to be presented in the parliament after elections. Who knows, the Prime Minister then, could very well be a Sindhi!